Award-winning radio personality and community activist Tom Joyner features his Take A Loved One to the Doctor (TALOTTD) campaign sponsored by Walmart on the Tom Joyner Morning Show (TJMS) all week long! TALOTTD health related coverage kicks off Monday October 21st and concludes with our annual “Dr. Day” broadcast on Friday, October 25th. Each day during the week of October 21st, the TJMS will cover a specific health related topic with celebrity guests and doctors. 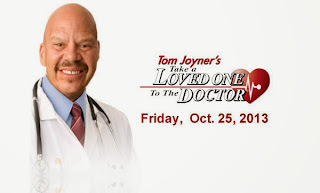 Tom Joyner Morning Show listeners will be able to text their health related questions to Tom Joyner’s “Text Tom Club” to a different doctor each day the "866.Joyner.6" health care phone lines on Friday October 25th from 6a-10a ET and have specialists from the Ohio State University Medical Center answer medical questions during our live broadcast. Additional health related content will also be available online at www.BlackAmericaWeb.com. Developed in 2002 to raise preventive health awareness in the African American community, TALOTTD has grown from one day into a full-fledged initiative that impacts more than eight million listeners weekly. The year-long health awareness campaign is heavily promoted through Joyner’s “Get Well Wednesdays” feature. National sponsors include Crest Pro-Health, The Ohio State University Medical Center and Walmart. To learn more about TALOTTD visit the micro site on BlackAmericaWeb.com: www.drday.blackamericaweb.com. Take A Loved One to the Doctor® (TALOTTD) is a targeted campaign to raise health awareness in the Black community. This initiative launched in 2002 between the Tom Joyner Morning Show (TJMS) and the U.S. Department of Health & Human Services Administration. Since then, Tom continues to encourage his listeners to be proactive about their health by making appointments for themselves and a loved one to visit health professionals.